Learn to Skate sessions have been posted for the 2018 - 2019 skating season. We offer lessons for beginners and experienced skaters. We have sessions for children and adults. Adults may skate with their children during the practice ice part of their session. Students will learn beginning stroking, stopping and crossovers. Students will learn backward edges, one foot spins, t-stop, spiral, lunge and bunny hop. 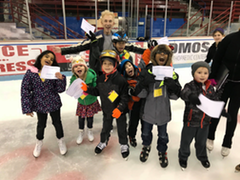 Level 3 & 4 Skaters will learn more advanced figure skating moves and techniques. Click here for more information. This is a good first step towards playing hockey. Students will focus on the basic skating skills needed to play. These include hockey stops, quick turns, footwork and balance. Hockey skates, stick helmet are required. Full hockey gear is not required, but recommended. *All memberships are non-refundable. All 2018 - 2019 season memberships expire on June 30th, 2019. Members, were have implemented a new system for you to pay and keep track of your figure freestyle time. This system replaces the manual card system. You now purchase tickets for ice time online. The tickets contain a QR code that is scanned before you enter the ice. Or have your attendance marked. You can purchase tickets for a single session or multiple sessions. The tickets can be printed out or displayed on your cell phone. The largest benefit of this new system is that you can log into your account and view when each ticket was used and how many times remain. Parents, we need help scanning tickets at figure freestyle sessions. Let us know if you can help us out with your iPhone or Android cell phone. Or help taking attendance. We now offer a contract ice program. You can sign a contract agreeing to purchase "all you can skate" for each month in the skating season. By agreeing to this, you will receive the discounted rate of $125 per month. Additional, graduated, rate is added for additional family member participant. Contact Coach Burton or Derek for more information.